All Banks in Nigeria has made it possible for its customer to be using USSD codes for money transfer directly from their mobile phone without going to any bank branch for such service. Although, this self-services which has been helping a lot of bank customers and also bank officials/workers, all started with USSD recharge code for crediting or topping up mobile phone airtime. After introducing that, next that followed was another service that enables customers to make money transfers and also make bill payments like ( DSTV, GOTV, Internet services and Electricity subscriptions etc,) just with a dial of USSD code from mobile phone. Now going to the bank hall to deposit money is a forgotten story for me, as I can stay anywhere and make any transaction (either with USSD code for money transfer or through my internet banking App) without stepping to banking halls. Using various Bank Mobile App can also go a long way to expose you to some other online or internet services which you can’t access using USSD Codes for offline services. Such service am talking of are gettingvarious banks swift codes for online transactions. that requires you getting the swift code for filling of a mandatory form for online payment. Also, another one is getting all Nigerian Bank sort codes which is usually used to denote where Bank account is held within any branch. So in other words, sort code identifies banks and as well, used in transferring of funds from one account in one bank branch to another branch of the bank to another bank. So mobile apps give a helping hand whenever you want to get for example your First city Monument bank (FCMB) sort codes for any branch of your Bank in Nigeria, and many more services which can be operated by customers right from their comfort zone. Going straight to what we have today, USSD code mobile money transfer service, scroll below and get your own bank code in order to proceed with sending/transferring money with just a dial on your handset. Remember, you can use some of these USSD codes to check your bank Account balance etc. You should also know that the using of these various banking codes is safe, fast and convenient. 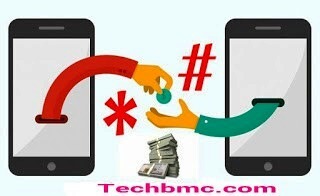 So having taken note of that, below are short codes for instant money transfer or payment of bills through your mobile phone; Be it Nokia torch, Blackberry, iphone/ipads, all Android smartphones like Tecno, infinix, gionee, Samsung, itel, Solo,etc. Recommended: How To Recharge Your Mobile Phone Or BuyCredit/ Airtime Using Bank USSD Code For All Banks In Nigeria. Customers are allowed to use First bank USSD code to transfer money,pay their bills both online and offline, withdraw money from account and make purchases. So to transfer money on First Bank in Nigeria simply dial this code *894# and then choose 1; To withdraw money after dialing the code, select 2, dial *894# and select 3 if you want to make a purchase; For payment of bills, dial *894# and select 4, and to buy airtime for your phone, just select 5; also to manage your account, dial *894# and select 7. With Zenith Bank’s 966 Mobile Banking code, you can open an account using your phone, transfer money to another bank account, load or recharge airtime, check your Zenith Bank Account Balance. In order to create a bank account using your mobile phone with zenith, simply dial this code *966*0# and ensure to follow the pop-up screen. For Detailed guide to do that without mistake click here for the post. To check any of your Zenith Bank account balance, just dial this *966*00# on your mobile phone. First, dial this USSD code this format *966*Amount*Account Number# and input the right details as required (for example *966*500*0012345678#) this should be done on the number you used in registering your account in Zenith, then follow the on-screen prompts. In order to initiate transfers to a GTBank account, simply dial this cod with the following format *737*1*Amount*NUBAN Account Number# ( For example, if you want to transfer 2000, do it this way; *737*1*2000*0004673282# Remember, you are to carry out this transaction on the registered mobile number to your GTBank Account. To transfer money from your GTBank Account to other Beneficiaries in other Banks, Simply dial this *737*2*Amount*NUBAN Account Number# (For example, if you want send #2000 to another customer from different bank then do it using this format of codes *737*2*2000*0002314567#. After that, you will be required to enter your GTBank Naira MasterCard last four digits in order to authenticate the transaction. This GTBank *737* code for transfer service done on mobile phone numbers is only available for GTBank registered customers. And the service offers a minimum transfer limit of N1,000 and a daily maximum transfer limit of N20,000 or More depends on how committed you are in using their platform in different transactions. For you to be able to use this service, you need to open a Diamond Bank Y’ello Account (DYA). So if you are searching for the latest 2017 method on how to open a Diamond Y’ello Account (DYA) just follow this guide to achieve that. Before then, for this DYA to be successful, you have to use MTN number, because the service was only initiated to work on MTN Nigeria due to the partnership between them and Diamond bank Nigeria. >> Enter your FIRST NAME and MIDDLE NAME, just send it. Another pop up will display asking you to input your SURNAME, enter it and send. >> Next enter your PIN and click on send. >> That’s all, your Diamond savings Account will be created automatically and you will receive an SMS after that with your NUBAN Account Number and other necessary details. >>To check your DYA account balance simply dial *710# and select 1 and send, from the displayed screen, select 2 and send again, next enter your pin to display the balance. >> To check your NUBAN Account number, dial *710# > select Bank service which is 1 >> select manage acct by replying 6 > then select 2 to display the NUBAN Acct Number. >> To buy credit/airtime from your Diamond Yello Account, dial *710# > select MTN service by typing 2 > from the on-screen select 1 or 2 to recharge your own number or another number not associated with your DYA respectively. >> To withdraw/cash-out money from your DYA Account, visit any nearby Diamond branch and do so. If you are using Diamond Bank, I recommend you to open a DYA account with them and enjoy most of their bonus and promo. You can also get a diamond yello loan from the bank when you play according to their loan terms and conditions. Ensure to secure your DYA pin, and In case you wish to deactivate or delete diamond yellow account, then dial the above code and select the option for that. As a Diamond Bank Y’ello account holder, You can Transfer money to any bank by Dialing this code *710*777*ACCOUNT NUMBER*AMOUNT*PIN#. And for Diamond Y’ello to Diamond Y’ello Transfers, achieve that by Dialing this *710*710*PHONE NUMBER*AMOUNT*PIN#. A MUST HAVE IF YOU HAVE A BANK ACCT: Download Nigerian Bank Account Verifier App For Verification Of Any Account Number. If you are using Eco bank, they have got you covered, as you can do almost all transactions with their Mobile USSD Code directly from your smart phones with just a dial. With Eco Bank Mobile USSD code, you can make an instant transfers, pay both online and offline bills, Buy airtime, Check your Account Balance, Read mini-statements and many more. >> To carry-out any of these transactions and more simply Dial *326# to get started. To get your money transferred from Fidelity bank account to another bank account, dial on your phone this code *770*NUBAN Account NO*Amount#; Don’t be confused at this point, the NUBAN Account number happens to be the 10 digit account number issued by any bank. For e.g; if you desire to make a transfer of N2000 to another customer from Access bank, then dial the code this way *770*2436167890*2000# As usual, this should be dialed on the phone number registered/ linked/Associated to your Fidelity Bank account. Then next, select the beneficiary bank Name (Access bank). Now input your Account transfer PIN to confirm the transaction. Note: The recipient account number will first display to you before you can enter your pin. As this is to let you know whether you are sending the money to the right account number or not. In case you have not used this Fidelity service before, you will be required to create one for yourself by dialing *770# then type in your NUBAN Account number (that is your Fidelity bank account number), and choose a 4-digit PIN for your account. If you are running two accounts with Fidelity Bank, may be current and savings acct with same phone number associated to the both accounts, then have it that making any transfer from that mobile number will first debit the current account before the other savings account. Note: This Wema Quick Recharge Code can only be used on the phone number registered with your account number as their customer. Transferring funds from Unity Bank USSD mobile banking is secured, very fast and safe for all banking with them. You can transfer from Unity Bank to other banks without having issues of any sort. To carry-out transaction with your account registered at Unity bank, Simply dial this code *389*215# as arranged/format. To transfer funds from your UBA bank accounts to other bank accounts, simply dial this code *919# on your registered SIM be it MTN, Airtel, Glo, Etisalat network etc. Hope you now know why I call it bank that others inherit from? Skye Bank USSD mobile banking offers you a wide range of self – service as a customer banking with them. With Skye bank USSD code, customers can perform transactions and operate right from their comfort zone without going to the bank for long queue. You can transfer funds to Skye bank accounts and to other customer’s accounts outside your bank, pay bills, check your account balance and many more services you can ever think of. >> Dial *833# and do any transaction needed to be done at the moment. Sterling Bank USSD gives customers a better banking experience service. Their code is *822# Ensure the phone number you are dialing the code on is the number registered with the account you have with Sterling Bank. So when you dial the code, follow the prompts on the screen to carry out your transactions. Note: Sterling Bank charges you N5 from your airtime balance anytime you dial the ussd code on your mobile phone. Also, the service of *822# requires PIN to completes its transaction when you are executing anyone. When it requires it, iput your pin to it. Remember the PIN am talking of, is the pin given to you during the process of registering for Sterling bank *822# service for the first time. 4. Finally, confirm the m-Pin you entered above. Note: customers are required to visit any nearby Keystone Bank branch in order to activate full/transfer access. You can call FCMB Contact Centre on this number 01-2798800 or visit any of their branch to generate your PIN. When you must have gotten your PIN, simply dial on your phone this code *389*214# and then click on Security, choose Change PIN in order to type in your default PIN, after that type in your new four digits PIN when you are prompted to do so. From now, you can dial *389*214# for regular access to FCMB Mobile service. That’s all for FCMB offline banking. As it stands now, Union Bank has only one feature for their customers, and the feature happens to be “checking of Account balance” which works through sending an SMS on a mobile phone. Although, according to them, they said currently they working on introducing other features like buying of airtime, transfer of funds, viewing of transaction history, etc all through mobile phone. >> To check your account balance on Union Bank via an SMS, just text Bal to this short number 20123 don’t forget, it should be on the phone number associated or registered to your Union Bank Account. For Other Banks which is not listed here on this post, Union Bank, Jaiz Bank USSD money transfer codes, we will ensure to update you guys once their various short ussd codes for bank transfer has been introduced to the public. Meanwhile, you can still continue using Quickteller to transfer money to various bank accounts in Nigeria just with the use of your mobile phone or account number. It is a good and better alternative to online banking platform. This Quickteller also enables you to transfer money/fund from your own account to other various banks in Nigeria provided you have been issued either a verve or Mastercard, VISA ATM card. For more bank services like how to open adomiciliary account for foreign currencies like Dollar, Euro etc and how totransfer or withdraw money/funds from a domiciliary account can be accessedhere.